TermCoach is a new adware-type program which is part of the Vitruvian adware family. We recommend that you remove this application, because it displays commercial third-party advertisements. However, it is advertised as a useful tool that will help you search for information online. Its promotional slogan is “Term Coach, searching with less hassle!” its website explicitly states that this application is ad-supported, but it does not say that they might compromise your computers security and even collect information about you. We have tested TermCoach, and have come to the conclusion that its cons far outweigh its pros. The Vitruvian adware applications are mostly disseminated using software bundles. As far as we can tell, TermCoach is mostly bundled with potentially unwanted programs and intrusive adware applications. However, there is slight possibility of it being packaged with legitimate programs, since this application itself gives an impression of reliability. This program is not the first of its kind. Before TermCoach was released, clones, such as WordShark, Phrase Professor, InfoAtoms, and QuickSurf, among other programs. Just like its clones, TermCoach is promoted on its own dedicated website at Termcoachapp.com, which hosts legal information that we took a look at. However, on the outside you will only see a neat browser extension that will help search for information. The way this application works is rather simple. All you need to do is highlight a certain phrase or a single word and click the program’s icon that is set to appear. Clicking the icon will open a window consisting of three tabs. The first tab will enter the highlighted text segment on Wikipedia.com. The second tab is a functional translator that features a satisfactory amount of languages. The third tab will provide linguistic information from a third-party server. Regardless of whether you find this application useful, we recommend that you remove it on grounds that it displays potentially unreliable third-party ads and gathers information about you. It is true that the functions offered by this application are not easy to find, but as we mentioned earlier, its disadvantages outweigh its advantages. Please you the instruction located below if you do not know how to uninstall TermCoach. Find TermCoach and right-click on it. Locate the unwanted program and click Remove. 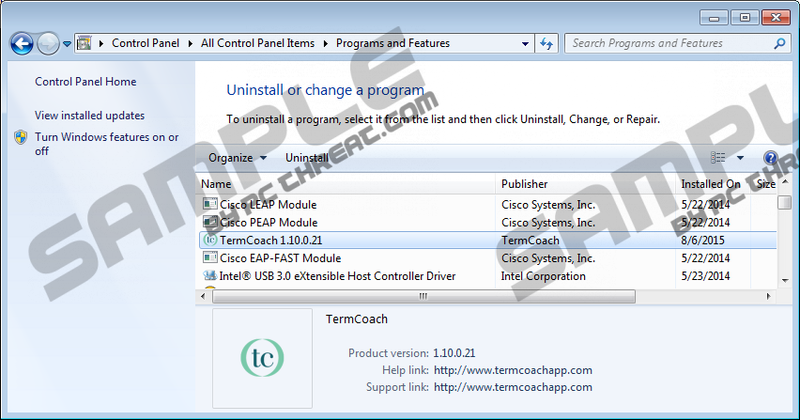 Find TermCoach and click Remove. Quick & tested solution for TermCoach removal.